Abstract: We study theoretically the di-neutron spatial correlations and the crossover from superfluidity of neutron Cooper pairs in the 1S0 pairing channel to Bose-Einstein condensation (BEC) of di-neutron pairs for both symmetric and neutron matter in the microscopic relativistic pairing theory. We take the bare nucleon-nucleon interaction Bonn-B in the particle-particle channel and the effective interaction PK1 of the relativistic mean-field approach in the particle-hole channel. It is found that the spatial structure of neutron Cooper pair wave function evolves continuously from BCS-type to BEC-type as density decreases. We see a strong concentration of the probability density revealed for the neutron pairs in the fairly small relative distance around 1.5 fm and the neutron Fermi momentum kFn is an element of [0.6, 1.0] fm-1. However, from the effective chemical potential and the quasiparticle excitation spectrum, there is no evidence for the appearance of a true BEC state of neutron pairs at any density. 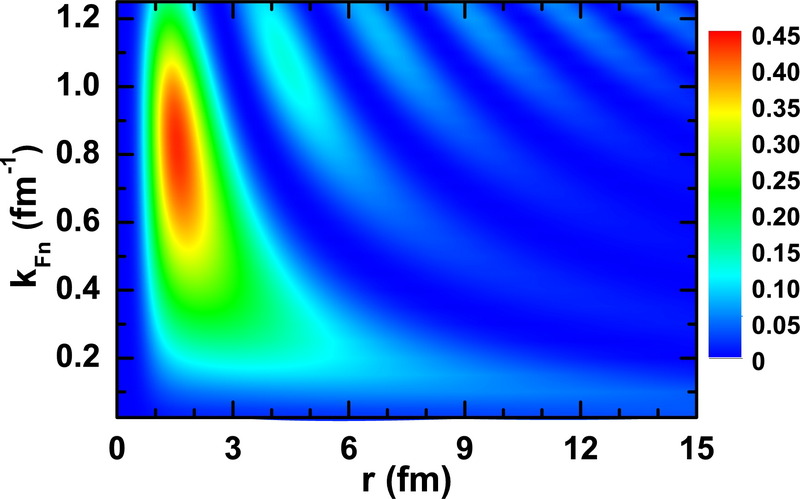 The most BEC-like state may appear at kFn – 0.2 fm-1 by examining the density correlation function. From the coherence length and the probability distribution of neutron Cooper pairs as well as the ratio between the neutron pairing gap and the kinetic energy at the Fermi surface, some features of the BCS-BEC crossover are seen in the density regions, 0.05 fm-1 < kFn < 0.7 (0.75) fm-1, for the symmetric nuclear (pure neutron) matter. Figure: A two-dimensional plot for the probability density r2|Ψpair(r)|2 of the neutron Cooper pairs as a function of the neutron Fermi momentum kFn and the relative distance r between the pair partners in symmetric nuclear matter. Abstract: The microscopic c. m. correction energies for nuclei ranging from oxygen to calcium are systematically calculated by both spherical and axially deformed relativistic mean-field (RMF) models with the effective interaction PK1. The microscopic c. m. correction energies strongly depend on the isospin as well as deformation and deviate from the phenomenological ones. The deformation effect is discussed in detail by comparing the deformed with the spherical RMF calculation. It is found that the direct and exchange terms of the c. m. correction energies are strongly correlated with the density distribution of nuclei and are suppressed in the deformed case. Figure: Microscopic c.m. 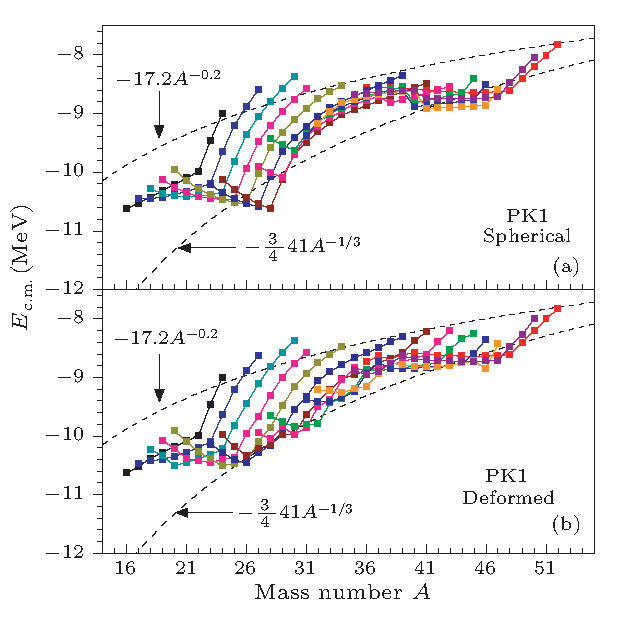 correction energies (solid lines) of nuclei ranging from Oxygen to Calcium in the spherical (a) and axially deformed (b) RMF calculations with the effective interaction PK1, in comparison with two phenomenological results (dashed lines). The solid lines from the left to the right respectively correspond to the isotopic chains from oxygen to calcium. Walecka J D. Ann. Phys., 1994, 83: 491. Serot B D, Walecka J D. Adv. Nucl. Phys., 1986, 16: 1. Bender M, Heenen P H, Reinhard P G. Revs. Mod. Phys., 2003, 75: 121. Meng J, Toki H, Zhou S G, et al. Prog. Part. Nucl. Phys., 2006, 57: 470. Bohr A, Mottelson B R, Pines D. Phys. Rev., 1958, 110: 936. Kucharek H, Ring P. Z. Phys. A, 1991, 339: 23. Long W H, Van Giai N, Meng J. Phys. Lett. B, 2006, 640: 150.